Brief Synopsis – Disney’s 2nd full length animated feature takes some popular classical music pieces and uses animation to create visual depictions of the songs. My Take on it – For as long as I can recall, this movie has always given me mixed feelings because some of the musical pieces are entertaining and enjoyable and others are too abstract and bore me to death. My favorite scene is by far The Sorcerer’s Apprentice which features Mickey Mouse using magic to try and clean up. It always amazes me how many times that theme has appeared in so many Disney movies. Its interesting to note that this movie still holds the record for being the longest Disney animated feature clocking in at slightly more than two hours. The idea of merging classical music with animation was a novel one and I think that it works much better when it tries to tell a story instead of just abstract animation. Bottom Line – Unbelievable idea that works in some pieces and bores in others. The Sorcerer’s Apprentice is clearly the best of the lot by far. Recommended! Ever try watching it with Pink Floyd? I’ll have to give that a try. Tnx Thomas! Yeah I really remember this movie boring me more than anything. Of course, I was a child. 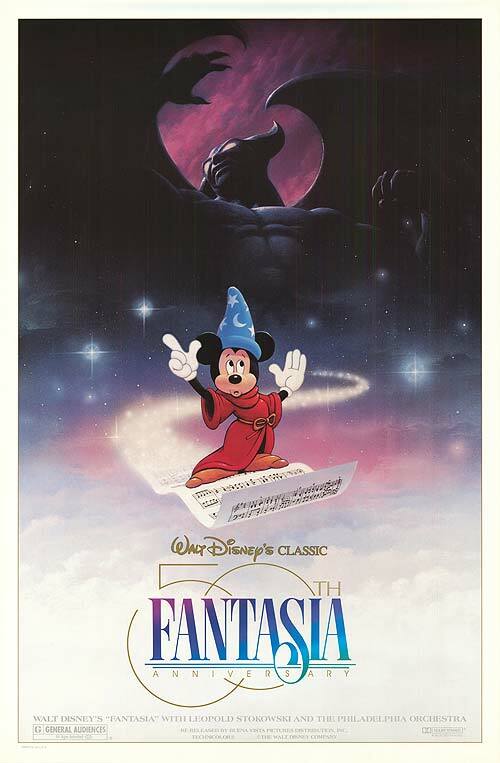 . . . .
Aww I remember Fantasia fondly. Definitely one of Disney’s trippiest films, but I liked it when I was a kid. I always liked the one with the storm and all the Pegasuses…Pegasi? Whatever. Lol. Great movie! Love the elephant scene. I thoroughly enjoyed this growing up to be honest. 🙂 Great review. Nothin wrong with that. Do u still like it as much? Haven’t seen it in ages and it is actually on my watch list haha!